Cor could simply walk to the island. With his armor on he would sink and his ring means he doesn't have to breath. Posted on 2015-12-01 at 00:31:21.
we could send perri/Xin to scout ahead an then use teleport once we have more of an idea what were headed into? Posted on 2015-12-02 at 12:11:51. Don't the spellcasters themselves need to go? Posted on 2015-12-02 at 17:33:30. The spellcasters need to be familiure with the spot so that all arrive safely. We would to appear two feet under ground or 100 feet in the air if the caster can't precisely visualize the location. Could get messy. Posted on 2015-12-02 at 20:08:22.
the week shot by soooooo quick. Are we agreed on going around the city and down the coast to the point? There Sirene, alone or with someone fly over to Cyclops to try to be able teleport the party over? We can RP the trek. Tann, how far can Ulthok and be seperated? Is the island too far? Posted on 2015-12-04 at 20:56:35. I hate to say this..... Actually no I don't lol.......... You don't know. However here's a hint, if your unsure how many flying potions it would take to reach the island that's pretty much your answer rt there. Posted on 2015-12-05 at 00:15:03. Okay, we need to make a decision and go. At this point I'm ready to just steal a damn boat! Is there anything around we can tie together to make into a raft or something along those lines? Posted on 2015-12-05 at 09:52:36.
rafts, walking, and boats, oh my! I would really, really like to see Cor try to walk down into the depths. But sending the dwarf into the depths of the ocean seems, well, unwise. But fun. A raft? I can't tell from the map on page 1 how long the distances are, but it seems like most movements in the game have taken some time. So the world isn't a tiny place, whatever Columbus might say. A raft on the ocean with a bunch of untrained sailors? Uhm, it would take some real convincing to get Lothor (who has spent time on boats, thus the name "Greenbeard," which should tell you something.) onto a raft. A stolen boat is better but has similar problems. Flying? I think we need to avoid the potions - we don't know if we have enough which is a big problem. But it seems like Sirene can do it on her own without the need for potions. Do we have any ability to keep her invisible for the entire trip? I hate splitting the party - especially when one person goes off alone. (Peri and Xin could go with?) But if she had some protection or stealth it might work. This feels a bit like we are dodging the GM's plans for the city and the golems. That is sometimes unwise. But having Sirene fly seems like the best idea to the warrior that gets to keep his two feet solidly on dry ground. Posted on 2015-12-05 at 10:30:53. I forgot that Ulthok has a scroll of creation...he can make a boat!!!!! So we hike to the coast, Ulthok uses the scroll and we try to sail it over. 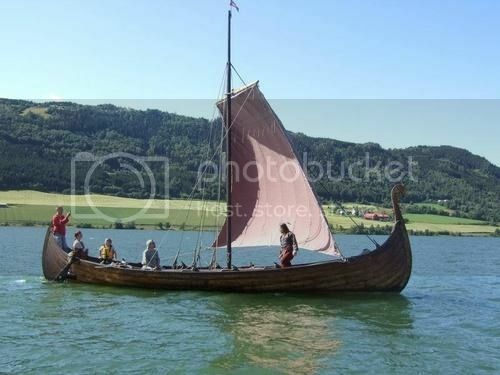 It could have a sail and ores so we can row when needed. Posted on 2015-12-05 at 15:25:46. Siréne has Major Creation prepared. For her that means a 13 foot boat with twice the duration. Might be good to save the scroll for a time in need. Whaddaya think? Posted on 2015-12-05 at 19:23:32. Sirene would be the one to fly or the one to make the boat. What does she think? Posted on 2015-12-05 at 19:51:23. Posted on 2015-12-05 at 21:06:33. Alrighty..... let's do the spell. So let's write about making our way to coast and find that bend. Ulthok will have Peri fly up high enough to help us. So you can use that. When we get to the bend Sirene can create the boat and we all shove off. Ulthok can use his potion of Dragon sight to help watch for trouble and the coast of Cyclops Island. What can the rest of you do to help sail across? Posted on 2015-12-05 at 21:56:21. Cor can sink to the bottom and pull the boat across with a rope. !!! Posted on 2015-12-06 at 10:07:33. Rayne doesn't seem to have really anything overly useful for sailing on a boat, but she has proficiency in Direction Sense. I guess that means she can help keep them on course. Aside from that, I guess help on the boat as needed, and fight with her bow if they are attacked are the other things she brings to the table. Posted on 2015-12-06 at 12:46:28.